People's Liberation Army Vice Admiral Shen Jinlong was scheduled to meet Chief of Naval Operations Admiral John Richardson on Saturday at the Pentagon. But the meeting was canceled and Shen abruptly ordered to return to China while attending a seapower conference at the Naval War College in Rhode Island. "We were informed that Vice Adm. Shen Jinlong has been recalled to China and would not conduct the visit with Adm. Richardson," Pentagon spokesman Lt. Col. Chris Logan said, without elaborating. Shen was to have made an official visit to the Pentagon as part of the Pentagon's military exchange program with China, which has been under fire from critics who say the visits have been used to boost Chinese warfighting capabilities while producing little in the way of building trust between the militaries. The exchange program is favored by some defense and military officials who believe the program will reduce tensions. In addition to cutting short the admiral's visit, China's military also canceled talks in Beijing with U.S. military officials on creating a communications channel between joint staff departments that had been set to begin Tuesday. 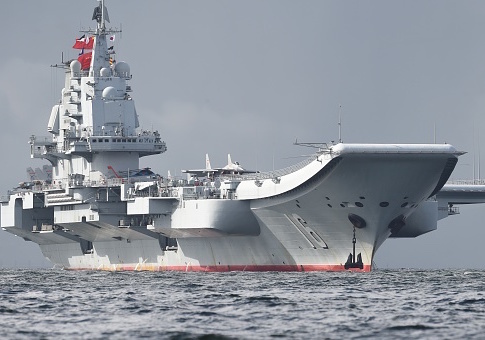 Late Wednesday, China took a third action against the U.S. military rejecting a Pentagon request for a U.S. warship to visit Hong Kong next month as part of the U.S.-China military exchange program. The amphibious assault ship USS Wasp, carrying Marines, was to make a port call but U.S. officials said Beijing turned down plans for the visit. The sanctions on the PLA for arms sales to Russia are an unprecedented rebuke of the Chinese military that has escaped American punitive action for decades—despite numerous strategic weapons transfers that have violated U.S. arms proliferation laws and United Nations sanctions. China shared strategic nuclear arms technology with Pakistan beginning in the 1980s—weapons know-how that later spread to North Korea, Iran, Syria, and Libya. No action was taken against China for the nuclear weapons proliferation because of U.S. policies that favored maintaining good trade relations with Beijing. Another significant failure was the lack of a U.S. government response to China's transfer of mobile missile launchers to North Korea beginning in 2014. The launchers are now used to carry Pyongyang's nuclear-tipped long-range missiles. The Trump administration was the first to sanction China for the launcher transfers in October. Defense Secretary Jim Mattis told reporters Monday the Pentagon is assessing the Chinese curtailing of exchanges and talks. "Right now, it's too early to say," Mattis said when asked about the impact of the action. "We're still sorting this out. We believe that we do have to have a relationship with China and Secretary [of State Mike] Pompeo and I are of one mind on this." The Chinese actions came in response to the State Department announcement last week that sanctions were imposed on Lt. Gen. Li Shangfu, a senior member of the Central Military Commission and director of the PLA Equipment Development Department that is in charge of weapons procurement. The sanctions were required for violating provisions of the 2017 Countering America's Adversaries Through Sanctions Act, known as CAATSA, legislation aimed at punishing enemies with sanctions. It was the first time sanctions were imposed under the act in response to significant military transfers by Moscow. State Department spokeswoman Heather Nauert said on Sept. 20 that President Trump issued a new executive order authorizing the sanctions targeting Russia. A total of 33 Russians and Russian organizations linked to defense or intelligence agencies were hit with sanctions. For the first time, the Chinese general and his armament section were punished under the law for recent purchases of advanced Su-35 jets and S-400 air defense missile systems from Russia through the state arms exporter known as Rosoboronexport. Under the law, anyone doing business with the Russian arms exporter faced mandatory sanctions. Retired Navy Capt. Jim Fanell said China's President Xi Jinping has sought to expand U.S.-China military-to-military relations, noting during the recent visit to China by Mattis that closer ties could be a stabilizing tool for overall relations between the two countries. "As such, the public recall of PLA Navy commander, Adm. Shen Jinlong, and the cancellation of the meeting with his U.S. counterpart demonstrates the effectiveness of the U.S. administration's announced sanctions against the Equipment Development Department," Fanell said. "So it should come as no surprise that Beijing will begin a campaign of continued statements and actions that dramatically reduce, if not eliminate, future scheduled PRC-U.S. mil-to-mil events." The Chinese appear to be betting the Pentagon and State Department are more interested in keeping up robust exchanges than China. Fanell said the Pentagon should not cave to Chinese pressure to resume the exchanges. "If there was ever a time for the U.S. to hold the line it is now," he said. "Instead of worrying about losses of [warship] port calls to Hong Kong, or canceled mil-to-mil events, the U.S. would do well to use this period of non-contact with the PLA as a time to detoxify and to funnel those energies into strengthening our existing alliances, and to build new bridges and partnerships. Once Beijing realizes that they are isolated against the rest of civilized society maybe then they will realize that their path of unilateral and selfish actions will not stand." China's Central Military Commission, the Communist Party organ in charge of the PLA, announced Saturday the postponing of the military talks and Shen's recall. Huang Xueping, deputy head of the commission's international military cooperation office, called the sanctions "a flagrant breach of basic rules of international relations" and "a stark show of hegemonism." Huang said the American action was unreasonable and severely harmed relations between the United States and China and the two militaries. He demanded the sanctions be lifted and threatened retaliatory action. "The Chinese military reserves the right to take further countermeasures," Huang said. The sanctions on China will prevent Chinese military weapons buyers from using the international financial system under U.S. jurisdiction for any transactions. The sanctions also seek to block any property owned by Li in the United States and prevent him from making any transactions involving the U.S. financial system. He also is banned from being granted a U.S. visa. Li is known to U.S. intelligence as a key figure in China's space warfare program. Until his recent appointment as head of the arms department, he was in charge of a new space warfare unit within the Strategic Support Force, the PLA's cyber, space, and electronic warfare service. Li in the past headed two satellite launch centers, including the Xichang Satellite Launch Center that was the location for the highly destructive 2007 anti-satellite missile test that blew up an orbiting Chinese weather satellite and left tens of thousands of dangerous, high-speed orbiting debris in space. Nauert said in a statement the sanctions were imposed as a result of Russian aggression in the Ukraine, annexation of Ukraine's Crimean Peninsula, cyber attacks, and interference in the 2016 presidential elections. "We will continue to vigorously implement CAATSA and urge all countries to curtail relationships with Russia’s defense and intelligence sectors, both of which are linked to malign activities worldwide," she said. A senior administration official said in announcing the sanctions that the jet and missile defense transfers were significant military transactions under the law. "We took these actions because China took delivery of 10 Sukhoi fighter aircraft, specifically Su-35s, in December of 2017—of course, after the CAATSA statute came into force," the official said. "And it also took delivery of a batch of S-400—sometimes known as SA-21—surface-to-air missile systems or related equipment in January of this year." Both took place after the sanctions law came into force and were negotiated between the Equipment EDD and Rosoboronexport. The law has deterred some states from working with Russian defense and intelligence. "But since China has now gone ahead and, in fact, done what is clearly a significant transaction by acquiring these Sukhois and S-400 missiles, we feel it necessary—indeed, we are required by the law—to take this step today," the official said. The State Department said in a fact sheet that the sanctions "are not intended to undermine the military capabilities or combat readiness of any country, but rather to impose costs on Russia in response to its interference in the United States election process, its unacceptable behavior in eastern Ukraine, and other malign activities." The department noted that it is committed to fully implementing the sanctions law that it assesses had deterred "billions of dollars-worth of potential arms exports from Russia." A total of 72 people and companies are now listed on the sanctions list, including Russia's Oboronlogistika OOO, a logistic company likely involved in transferring the jets and missiles to China, and Komsomolsk-on-Amur Aviation Production Organization, the maker of the Su-35.